Malini Murjani lives for luxury. Her life is “about extremes,” and this philosophy invades her accessories collection as well. 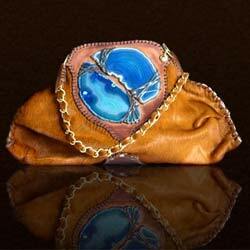 Full of luxury materials like agate stones, embossed leathers, and exotic skins, Murjani’s handbag collection utilizes sensuous colors and textures to create a sophisticated collection of opulent items. 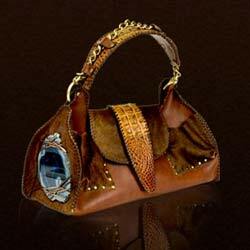 The tanned, brushed, calf–hair saddlebag with chain–link strap, and a pop of color from a strategically placed turquoise agate stone. The shoulder bag, which cohesively incorporates components of embossed leather, calf hair, exotic skins, chains, studs and agate stones. 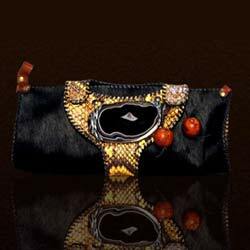 The basic black calf–hair clutch, with elements of exotic skin, leather whipstitching and trim, and multicolored stones. For more information, visit http://www.malinim.com.